Here is a case of mistranslation that one of my students pointed out to me. Though some translations have corrected it, it is a good platform to present a rule in Hebrew. 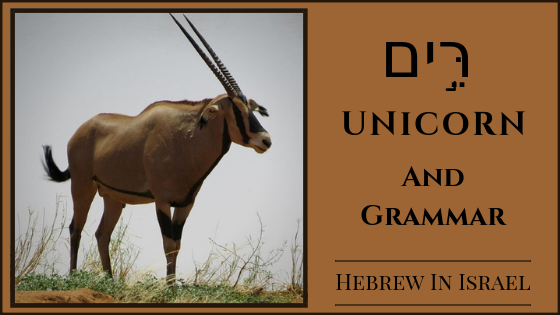 The word for Unicorn in Hebrew is רֵּ֣ים rrêm which is probably an Oryx. The animal known as ראם has been well known for years, and there is no doubt about the identification. The translations which translate to unicorn are probably based on a Latin translation which describes a rhino, and in time it was recognized as a unicorn. But as stated, ראם is without a doubt an Oryx. The word in question seems to have undergone an assimilation of the guttural א from the original spelling ראם, which was changed to רים but kept the same vowel which was shortened due to the absence of the א. Dissimulation is when a consonant drops out of the spelling by mistake, or is represented in writing in its phonetic form due to a change in speech. Assimilation of this kind can be found in other places in the Tanakh, and is a feature of Post Biblical Hebrew of the 2nd temple. The assimilation created a word which was unrecognizable to the translators, leading them to invent a new animal or translate the word to something which it is not.